In the current state of accountability measures, it is sometimes hard not to get bogged down with what feels like a long checklist of requirements and things that need to get accomplished. While this reality is inescapable, some of the strongest teachers with whom I am lucky collaborate have shifted their thinking from “I can’t get to the instruction I know my kids need because of…..” to “How can I prioritize what I know my students need in my current context?” One of the best ways to do this is developing purposeful independent learning experiences that are representative of real-world reading practices. This is often where teachers have the most freedom in their instruction. In a typical reading workshop model, approximately 50% of students’ literacy experiences are spent without direct support of the teacher (this is often referred to as independent and/or partner work). The options for this time are endless, but when planning these experiences, I always ask myself, “What do I want my readers to do/know/experience?” and “What purpose does this serve in their reading lives?” Years ago, these questions helped me shift my thinking about independent work experiences. The answer to these questions for me (regardless of grade level) is that I want my readers to read, to love reading, to share reading experiences with others, and to explore, question, learn and grow through experiences with texts. I think the purpose of these goals serves to create life-long readers and inquirers. Purposeful pedagogy helps us work toward that goal. What does purposeful pedagogy look like in practice? I spent a couple of years researching and learning alongside an amazing first-grade teacher, Meridith Ogden. When we first started working together, she identified pedagogical goals related to her literacy instruction. Together we developed instructional ideas and a plan for how we would address and research the progress toward these goals. The goals were (1) to have students develop a love of reading; (2) to have students understand that the ultimate goal of reading is to construct meaning; (3) to have students independently applying comprehension skills across a wide variety of texts; and (4) to engage students in meaningful discussions about literature with interpretive responses. Our instructional plans for addressing these goals involved whole-group, small-group, and conferring practices. However, we decided to really focus on supporting those goals and students’ reading experiences by enhancing the purpose and meaning during the independent work time of the reading workshop. Table from What are the Rest of my Kids Doing? Fostering Independence in the K-2 Reading Workshop (Moses & Ogden, 2017). We just kept going back to…what is the purpose of this learning experience? If it didn’t serve the most essential purposes, then we tossed it out. We didn’t have enough time for busy work, worksheets, or meaningless activities (we also just don’t want these to be part of our practice). These types of activities often keep children quiet, but quiet means compliant- it is NOT a measure of literacy learning and development. One of my favorite end-of-year quotes from an interview with a first grader was, “We’re a little loud. That’s because we like to read!” Part of our purpose involved creating a community of readers who read, shared, and talked about texts with peers. Below is a model we designed to support purposeful independent learning experiences. We start with establishing routines that help students shop for books they love and are able to engage with during independent reading. This takes time, getting to know kids and their interests, as well as books that are a good fit. We also focus on establishing routines for what we do during independent reading and why- all of this is grounded in what real readers do. We modeled how we shop for books (browsing, looking at the cover, reading a few pages, getting recommendations from friends, etc.). Next, we introduced strategies that would help students be able to read independently and with partners (both fix-up and comprehension). Students could use these strategies as a response opportunity to document their thinking and prepare for discussions with partners or discussion groups. While reading informational texts, students had the same option for documenting strategy use in preparation for conversations, but they also had the opportunity to design their own inquiry projects based on a topic of interest. Finally, we move to collaborative “independent” experiences. We believe there is nothing more powerful than young readers being able to independently collaborate with partners and small groups of peers. We build on the routines, strategies, and response opportunities to prepare them for meaningful engagement with reading and their community of readers. For us, the key is purposeful pedagogy. We design and support independent learning experiences with a clear purpose that mirror the real work and social interactions of readers. 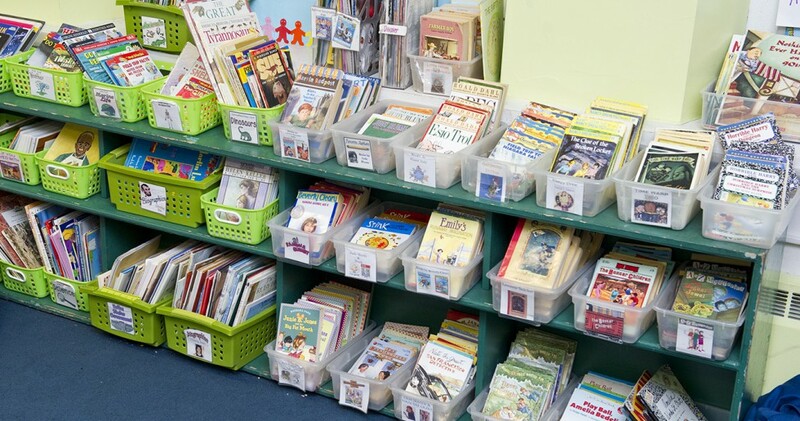 Yes, it is a little noisier and messier than traditional independent seat work, but it is worth it because it allows young readers to develop a love of, connection to, and confidence in reading. Recently, I’ve been starting PD sessions by asking teachers to engage in what Harvard’s Project Zero calls a “chalk talk.” A chalk talk asks participants to consider a question then silently write down their ideas about it, without talking to each other. Then once they’ve gotten their own ideas down, they’re invited to respond to others—again, without any talking. Inevitably, what this does is narrow the door for readers in a way that can give them a warped view of reading—and it prevents us from seeing all they might be capable of. To see what I mean, let’s imagine two groups of students both reading the following passage from Patricia Reilly Griff’s Fish Face, which is a Fountas & Pinnell level M book. One group is being asked to identifying character traits, a commonly taught skill, while the other is reading the passage more holistically to consider what it might mean in a broader way. While standardized tests are all about answers, reading is an act of meaning making, and the first thing we need to do is shift our focus from looking for answers to thinking. To do that, we need to be, as Walt Whitman once said, “curious, not judgmental.” That means not hopscotching from student to student until we get the answer we’re seeking, but accepting a wide a range of thinking—not to debate, but to consider. It also means honoring provisional thinking, which uses words like might, couldandmaybe. After all, the only way to really know what’s going on with the characters in Fish Face is to suspend judgment and keep on reading with these possibilities in mind, revising your ideas as you go. Take, for instance, the small group of fourth graders I used the Fish Face passage with. Like our second group, they inferred up a storm, though they hadn’t explicitly been asked to. After they’d shared their thinking, though, I asked them—in front of all the fourth grade teachers—if they knew what the word inferringmeant. To their teachers’ dismay, some said they’d never heard it before, while others said they’d heard it, but couldn’t remember what it meant. But finally, a boy said he knew what it meant: reading between the lines. The problem with standards is not that they aim to high but that often they do not lift us up nearly enough. The great irony is that when we teach writing for the right reasons. . . the little things tend to fall into place anyway. . . What’s more, the writer learns to care about such things, not because we said we said she should, but because they took her to a place where her writing became powerful. Spandel, Vicki. 2005. The 9 Rights of Every Readers. Portsmouth, NH: Heinemann. Giff, Patricia Reilly. 1984. Fish Face. New York: Random House Children’s Books.